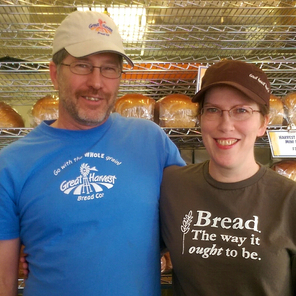 Welcome to our Cedar Rapids Great Harvest Bread Co. website! Sixteen years ago, we decided to return to Dion's home town to raise our family. We wanted to live in a warm and generous community where we could raise our kids among friends who share our values. We love the diversity of our community as well as the great educational and arts related opportunities. And we love the pace of life as well as the prevailing commitment to a job well done and to enjoying life to the fullest. For many years we've dreamed of owning our own business where we could work together and where we could create the kind of place we'd love to visit. Many of you know how much Dion loves to bake, and our commitment to wholesome foods that taste terrific led us to Great Harvest. They have been making great bread in communities across America for over 30 years. The Great Harvest "Freedom Franchise" philosophy means that we have the freedom to run our business in a way that meets our community's unique needs. Belonging to a franchise gives us access to the recipes and processes that Great Harvest has continuously improved over the decades. The result is the best tasting baked goods in a setting that is uniquely our own. We will be working as much as possible with Iowa suppliers of ingredients and baking all our products from scratch in our bakery. In addition, we are committed to making our bakery as environmentally friendly as possible. We'll choose reusable products and select the options with the smallest carbon footprint we can. We promise to choose and serve the best quality coffee and tea and other beverages and serve the freshest and best tasting sandwiches and treats. We are very excited to share the Great Harvest tradition with our neighbors and friends, and we can't wait to see you in our store. We are committed to giving back to our community with a particular emphasis on feeding the hungry. Rather than selling "day old bread," we give it for several food banks in our community. In addition we budget for several donations of food or gift baskets for silent auctions for fundraising each month. Our guidelines include a focus on helping the community at large rather than individuals, and we give first priority to programs that feed the hungry and provide for children. If you have an event and would like to request a donation, please stop by the store for a donation request form or print one out here and bring it in or send it to us: DONATION REQUEST FORM Our budget is typically allocated a full month in advance, so please submit your request as early as possible. Thanks for stopping by, and come on in for a fresh free slice of bread.